As a sushi restaurant with an innovative, 100% vegan bar program in a potentially haunted historical building in Baltimore, Sticky Rice Baltimore is definitely one-of-a-kind. So too is Ginny Lawhorn, the restaurant's managing partner and bar wizard. With nearly two decades of service industry experience, a serious amount of knowledge, Ginny knows a thing or two about the bar business. 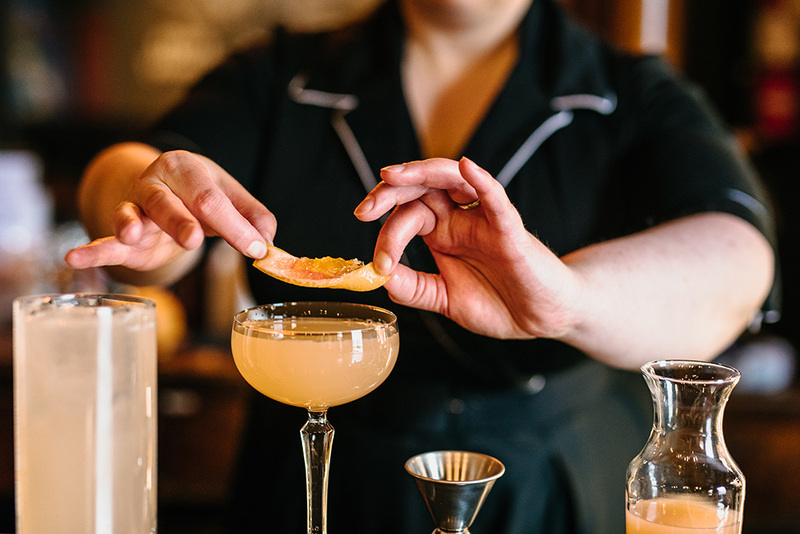 We recently chatted with Ginny about what it takes to run a bar, being a part of Baltimore's bar scene, and how to cure many of life's ailments with whiskey and water. She also shared with us her recipe for the tasty, versatile, and fantastically-named Just Like Honey. I'm Ginny Lawhorn, Managing Partner of Sticky Rice Baltimore and Bar Lead at Landmark Theatre, Harbor East. I have been bartending for 16 years. I have run the bar program with Landmark Harbor East for 10 years and have managed the Front of House and beverage program at Sticky Rice Baltimore for six years. Oh, gosh…a need to pay my rent while I was in school got me into hospitality. That and being too antsy and too nocturnal for offices. What got me behind a bar was the fastest “YES!” in the west when a bartender no-showed for a shift, and I swore I could cover the service bar. I dug my heals in and stayed put from there. Anything Amie Ward at R. Bar or Chelsea Gregoire at Hotel Revival. The company can not be beat! Put your faith in the brilliance, skills, and knowledge of these badass babes! A Last Word. I am very partial to ratio cocktails and am head over heals for “perfect” cocktails. Last Words are equal measure classic cocktail, timeless chic, international flair, and good taste. The scent of a well made Last Word also lingers just long enough to brighten the day of those around it! 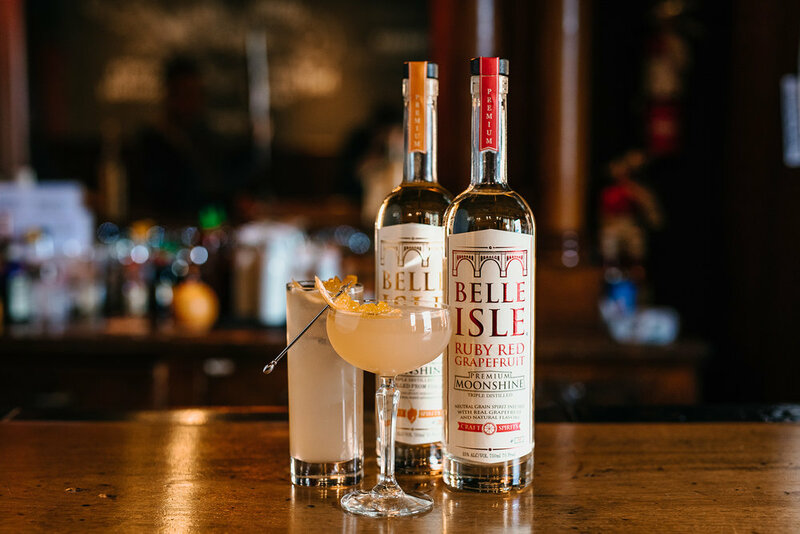 Try subbing Belle Isle Ruby Red Grapefruit for the gin in a Last Word for an extra zippy citrus-forward gem! Orangina! I love citrus. I think Orangina is a gift from the heavens. My mom used to say the only thing I took away from living in California when I was little is an obsession with Orangina and artichokes. Water, sparkling and flat. I think water is the most underutilized component of cocktail programs. I often joke that whiskey in water is the cure to most ailments. Sore throat? Whiskey in hot water. Upset stomach? Whiskey in sparkling water. Heartbreak? Whiskey on the rocks. My very favorite part of working in hospitality is building your “Bar Family.” The time you spend locked behind a bar, or on the floor of a restaurant, or in a kitchen provides very unique environments for relationship building. Sharing small spaces, working long shifts and late nights day after day creates bonds you don’t find in every field. The respect for personhood and sense of community in our industry is our pillar of strength and strongest intrinsic value. I am grateful for the opportunity to help create and cultivate a work home for my teams. Landmark is unique in the constantly changing line up of guests based on film release. Seven movie screens with seven titles offers seven audiences. It is a super fun setting for a movie geek. 10 years later I am still super excited to talk movie shop with guests every new release Friday. Sticky Rice Baltimore is incredibly unique in environment. In 1904, a mahogany wood bar was commissioned in Germany destined for a home in America. After being meticulously crafted and spending several months at sea this bar arrived in the port of Baltimore. With might and some struggle it was installed by hand at 1634 Aliceanna Street. This bar found its home at Dix Hotel, an Irish bar on the first floor topped with two floors of boarding rooms above. Over the next century this bar would continually operate, passing through a few hands and concepts. In 2010, Sticky Rice Baltimore found a home here. Embracing the truest roots of Baltimore's hospitality while mixing in fusion offerings, we have been fortunate to belly up to this bar for the last eight years. I don’t take for granted our incredible fortune to be able to see this bar through this generation and iteration of hospitality. The building is haunted AF too. I am a sucker for a nice patio and a good view! Little Havana is my favorite in Baltimore. Parc is my must in Philly. Momofuku CCDC is my favorite guilty pleasure in DC. Baltimore has an incredibly vibrant cocktail culture that is very supportive and inclusive. It is a city that takes pride in the beer and spirits made here. Union Craft Brewing is leading by incredible example in support and inclusion with the creation of the Union Craft Collective. This new space will house Union Brewing, Baltimore Whiskey Company, Vent Coffee and a variety of other local purveyors. For both guests and bartenders, wherever possible: “Be kind to everyone you meet, for everyone you meet is fighting a hard battle”. I don’t say it to sound cliché or “golden rule” shame anyone. Just as a simple reminder that you don’t know what happened that has brought this person in front of you. I went to work the day my best friend passed away from breast cancer because I didn’t know where else to go or what else to do. I have had guests come in immediately following being laid off because seeing a movie was what made sense at that time. "Please" and "Thank You" always help! Lead with kindness whenever you are able. A Belle Isle Honey Habanero Bloody Mary outside of Sticky Rice Baltimore! 1. Coupe - In a mixing tin over ice combine all ingredients. Shake vigorously and strain into a chilled coupe. Garnish will honeycomb inside of a grapefruit peel. 2. Highball - In a mixing tin over ice combine all ingredients. Shake vigorously and strain into a highball glass over fresh ice. Top with sparkling water. Garnish with honeycomb inside of a grapefruit peel. Want to go behind more bars?